G D Armour was a painter and illustrator in oil, watercolour, pen and ink and pastel and was "…one of the outstanding artists of his period". He was born in Waterside, Lanarkshire on 30th January 1864 but spent his early life in Liverpool before going to Fife to be educated followed by university at St Andrews, and his father, an enthusiastic member of the Lanark and Renfrewshire Hunt, was a cotton broker. Although he was destined to inherit his father's interest, his calling lay with art and consequently he studied at the Edinburgh School of Art and the Royal Scottish Academy from 1880 to about 1888. Initially, he began his career with oil paintings of animal life - which he had started to show at Scottish exhibitions in the latter half of the 1880's - which were deemed to be amongst the most promising works of their type. He left Scotland in 1888, going to London to work as a painter and illustrator and it was there that he became increasingly influenced by the artist Joseph Crawhall whom he had met and befriended on another trip to Tangiers. Crawhall was a highly accomplished observer and painter of animals, whose work represented the break from the Victorian tradition of painting. 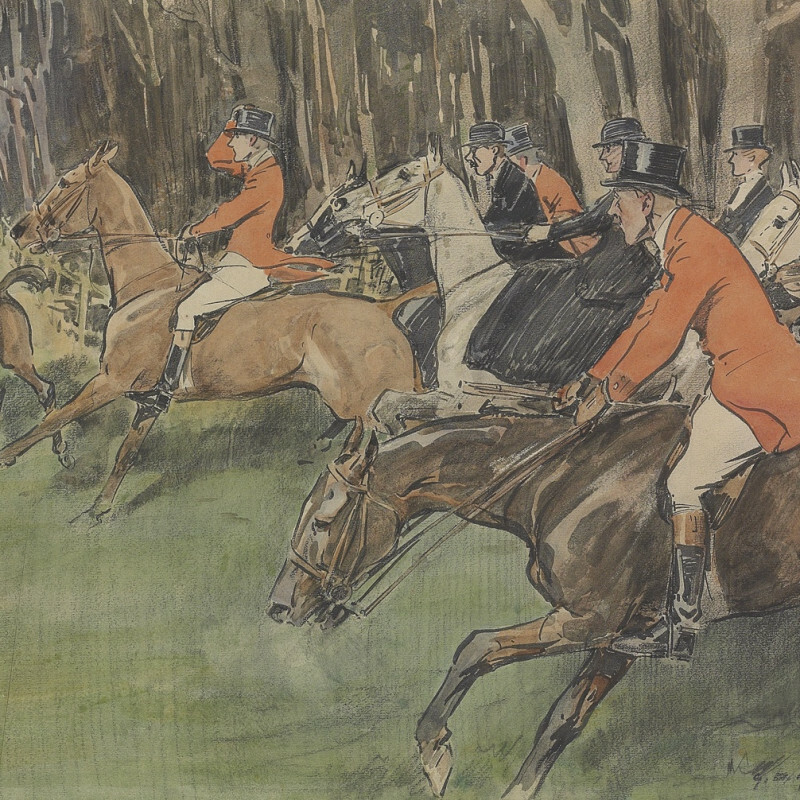 Through his work for Punch, the Daily Graphic, Tatler and others, Armour's reputation increased with his depiction of horses, racing, hunting, fishing and shooting, the majority imbued with an amusing nature which appealed to the English character and transcended social classes. The pursuit of these field-sports was often portrayed in wet and muddy conditions which added to their appeal. Linen was often the medium for his colour pictures which suited his subtlety and these were utilised in books such as two volumes of "Thoughts on Hunting" by Jorrocks and Beckford. In 1910 he went to the Spanish Riding School in Vienna and also elsewhere in Austria-Hungary to study military horse procedures, producing a great number of sketches. In 1913, on behalf of Country Life, he travelled to New York and Long Island, to cover the International Polo Tournament and the following year he went to France to study hounds and visit Saumur. With the outbreak of the First World War in 1914, he joined the Remount Stables near Southampton. Later during the war, he went to Rouen and also to the Macedonian front and it was for this, his period commanding the depot of the Army Remount Service in Salonika between 1917 and 1919, that he was appointed OBE in 1919. During his life, apart from his contributions to various publications, Armour exhibited extensively with 66 works at the Fine Art Society, 218 at the Leicester Gallery, 63 at the Royal Scottish Academy, 16 at the Royal Academy as well as at other venues and institutions in England and Scotland. He also produced a number of commissioned equestrian portraits such as: "Sir Lionel Durell", "Captain Gerald Digby" and "Dowager Duchess of Beaufort". Examples of his work are held in the collections of Punch magazine, Glasgow Museum and the Victoria and Albert Museum.